There are few more months for the summer to subside. Unlike other parts of the world, Chennai is scorching hot during summer. Everybody yearns to cool themselves. I fear of going out during mid day and mostly try to reach office before it gets too hot. Except the heat, I love summer as it brings out seasonal fruits like mangoes, figs, watermelon, cantaloupe, vegetables like bitter gourd, ridge gourd,bottle gourd, drinks like buttermilk, lassi, jaljeera, vadagam like javarasi vadam, arisi vadam and pickles like avakay mango pickle, lemon pickle. These days it is common to get all the fruits and vegetables all around the year but there are certain fruits that are available only on a seasonal basis and these fruits taste really good. Star goose berries are the perfect example for this. Star gooseberries look bright green in colour when it is raw and turn into pale yellowish green when they are ripe. It tastes very tart and majority of them are consumed raw. I have seen them used in pickle and syrup here in Tamil Nadu. But sources say this fruit and its leaves have been used for cooking in the form of chutney, syrup and fruit juice. I prepared a pickle recipe from this fruit. We can use both tender or ripe ones for making pickle but I preferred the ripe ones as it is less tart and soft. Dry red chillies - 12- 15 nos. 1) Remove the stem of each gooseberry. Wash and wipe well using kitchen cloth. 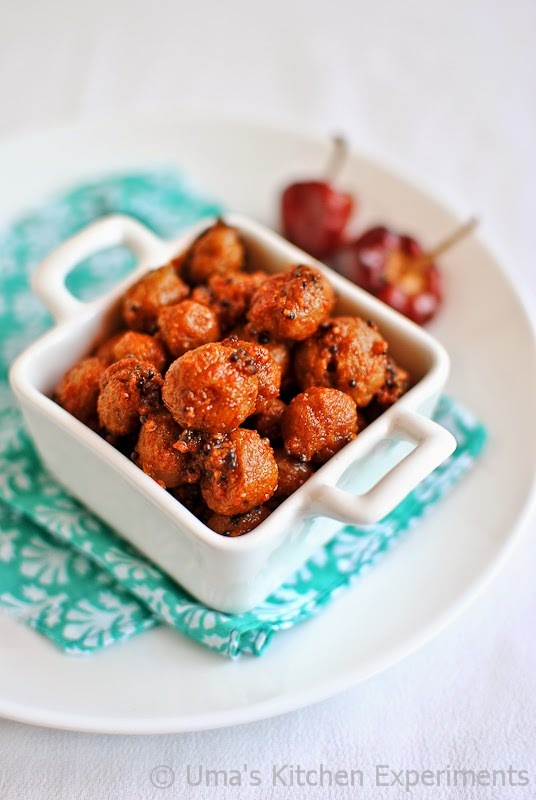 2) Take a Kadai / Pan and dry roast both fenugreek and dry red chilli. Make sure to roast it in a medium flame as fenugreek seeds tend to burn quickly. 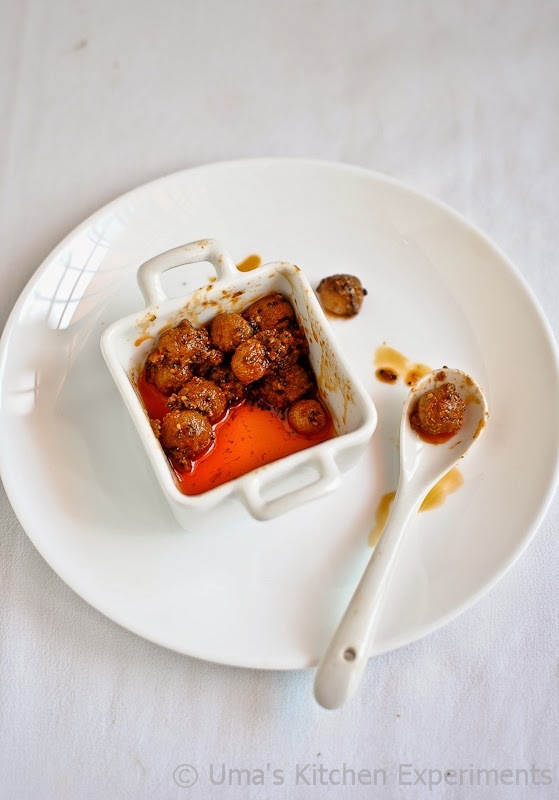 3) Cool the roasted ingredients to room temperature and make a fine powder of it using a mixer. Keep aside. 4) To the same Kadai / Pan, add the oil. When it hot and not smoking, add mustard seeds and let it splutter. Cover using a lid to avoid the spluttering of seeds all over. 5) Add berries and saute till they are cooked well. 6) Once done, turn off the flame and add powdered masala and salt to it. 7) Mix well. Let it cool down for few minutes. 8) Store it in a clean and dry jar for future use. 9) This pickle stays good for a weeks time. However if you store it in the refrigerator, it stays good for upto 2 weeks. 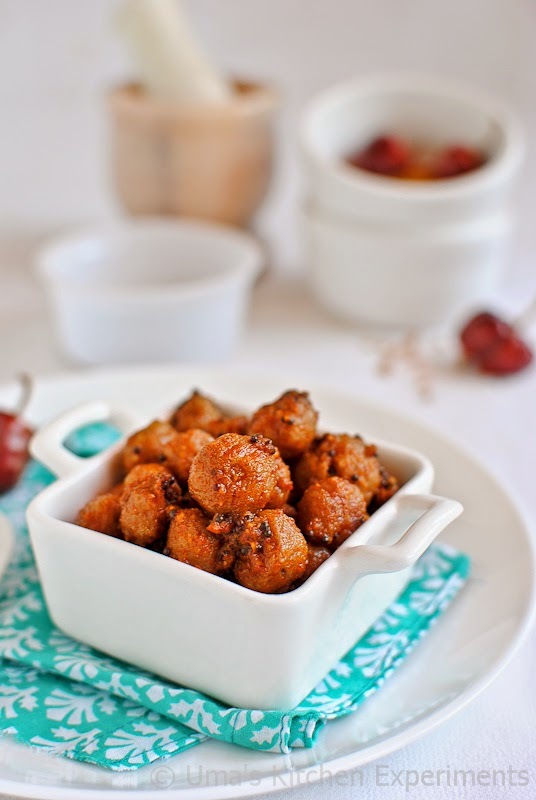 1) Star gooseberries can be substituted with gooseberries wedges (Amla). 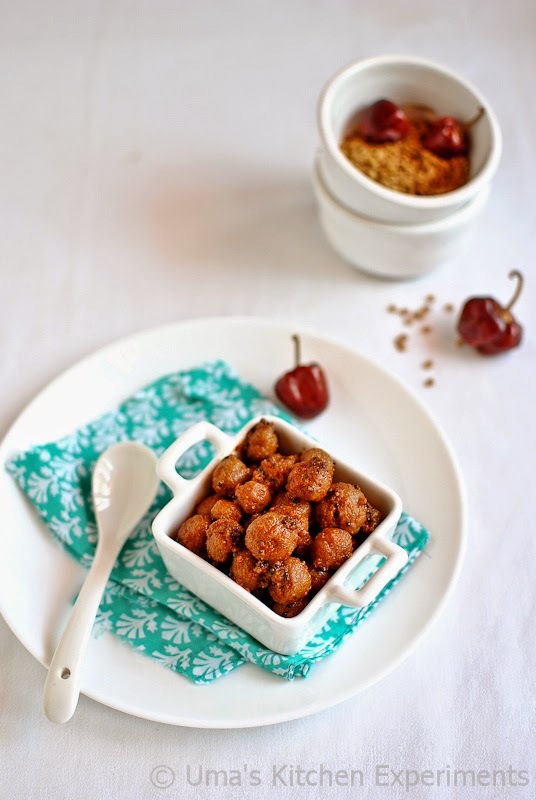 2) More dry red chillies can be added to compensate the sourness of the star gooseberries. You can adjust the chillies as per your taste. looks so tempting, love to have it with rotis. Tangy and tasty goes-berry pickle ! This tempting me badly ! Delicious and lovely looking gooseberry pickle. Awesome pics as well. My mouth is full of water, pickle is just torturing me Uma. tempting ones,nice clicks too !! thank u soo much uma madam.. Mouth watering..